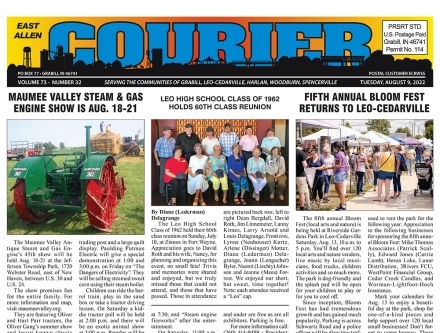 The East Allen Courier is a weekly free-circulation newspaper delivered to over 7000 homes or businesses in Grabill, Leo, Harlan, Spencerville, and Woodburn. Subscriptions are available for those outside the free-circulation area. Advertising rates are $6.00 per column inch (b/w) on inside pages. $10.00 per column inch (b/w) for front page. Photos that accompany news articles are free. Ads, news or photos can be submitted by emailing eacourier@mediacombb.net.